This is a wonderful Friday because it marks the start of summer, aka..Memorial Day weekend! I am pumped for a weekend with my bestie, AMF! I am also pumped to say 3 MORE WEEKS!!! Summer has been calling my name for quite some time now so each day as it gets closer I've been doing a little happy dance inside! Why have I been silent in the blogosphere this week you might be asking? Well y'all, let me tell you-- I've got a crush. 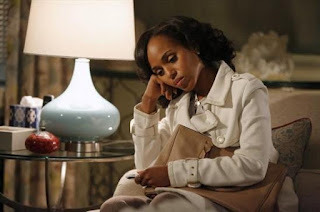 A big giant girl crush on Scandal's leading lady Olivia Pope (by the way, isn't that a beautiful name...Olivia Pope!)! Let me give you a little background. Bryce has been in London since Saturday and won't be home until late Tuesday night. 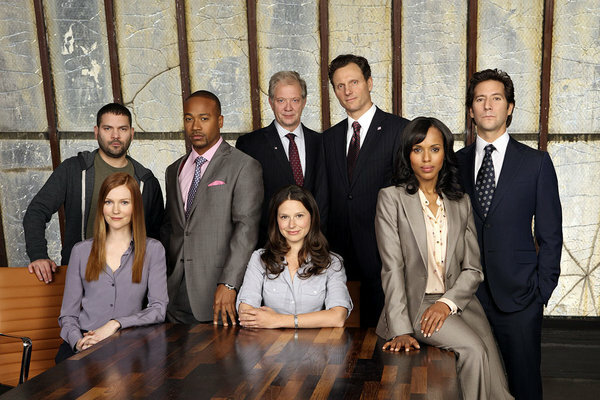 While I've been holding down the fort I figured now was the perfect time to start watching Scandal. I've been curious about it since the show first aired, but because I'm picky about not starting a show in the middle and missed the first episodes, I hadn't watched. Well, we recently got Netflix...and one thing led to another! It's bad guys! I have stayed up past my bedtime every night this week watching Scandal! Now I've finished Season 1 and am planning to sign up for a free trial of Hulu Plus immediately after finishing this post so I can get started on Season 2! Can't decide if I love him or hate him yet; guess we'll see how Season 2 goes! Also, I'd kill for those teeny tiny, toned arms! And I'd kill for that lamp! Her apartment in the epitome of chic. So curious about Miss Quinn! What have y'all been up to this week? Do you watch Scandal? What are your favorite TV shows? I started watching this season but I missed the first few episodes and I missed all of season one. I'm sure you will LOVE season two it is so juicy!!! This is one of my favorite shows! Corey loves it too and watches with me every week. The finale was amazing so I'm on the edge of my seat waiting for next season! Oh goodness, get ready for season 2! I am obsessed with the show and every episode I have to watch a few times to really catch everything. I can't wait for the fall with Season 3!! I've definitely been wanting to watch this. Kerry Washington is GORGEOUS!! And so tiny. Might be a good weekend to catch up on this show since I don't really have any big plans. I just started watching Season 1 on Netflix and I don't want it to end! Such a great show. She really does have a great wardrobe. I am glad you found the show it is amazing. I'm obsessed with this show!!! She is flawless! I'm obsessed with her wardrobe on it!